Hydroboration is the treatment of alkynes with BH3, followed by H2O2 in which aldehydes and ketones are obtained. 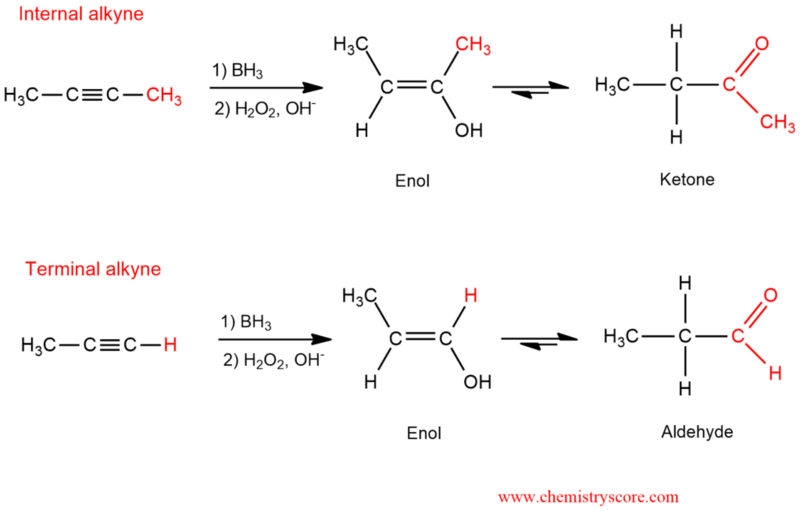 Hydroboration is a two-step reaction sequence which proceeds via an anti-Markovnikov addition where installing a hydroxyl group at the less substituted position. In the first step comes to hydroboration and oxidation of alkyne. Addition of borane forms an organoborane. When we have an asymmetric alkyne, the addition of BH2 will be achieved on a less substituted carbon atom (anti-Markovnikov rule). And oxidation of this organoborane with basic H2O2 forms an enol. Enol is an unstable intermediate which we cannot isolate. In the second step, enol that we obtained is subject to tautomerization which cannot be prevented. Depending on which alkyne is started (terminal or internal), aldehydes or ketones are obtained. As we can see, the overall result is an addition of H2O to a triple bond. Tautomerization can be catalyzed by either acid or base. And now we will see how exactly takes place the base catalytic tautomerization. STEP 1. The hydroxyl group of the enol is deprotonated and resonance-stabilized enolate ion is formed. STEP 2. The enolate ion is protonated to give an aldehyde.